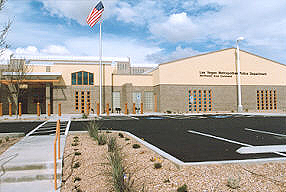 The offices of the Northwest Area Command is located at 9850 W. Cheyenne, just west of Grand Canyon. The Northwest Area Command is open Monday - Friday 9am to 5pm, Saturday 8am to 4pm and closed on Sunday. Northwest Area Command is staffed with 145 employees to include: 108 police officers; 9 new officers in training; 12 sergeants; 4 lieutenants; 7 clerical personnel; 4 service aids; and one captain. Northwest Area Command geographical boundaries are within the metropolitan area are everything north of Charleston Boulevard and west of Interstate 15. The Northwest Area Command provides police services to approximately 220,000 residents and encompasses residential areas, business districts, gaming establishments, and public housing areas.